Are you driving something popular or a little offbeat? Here is what people are driving…. Some people think the type of vehicle you drive represents the kind of person you are. If you’re a truck person, maybe you’re going for the rugged look, or if you have a convertible maybe you’re all about that “care-free” vibe. A map recently released by Imgur shows that another big factor in what you drive might actually be where you live. 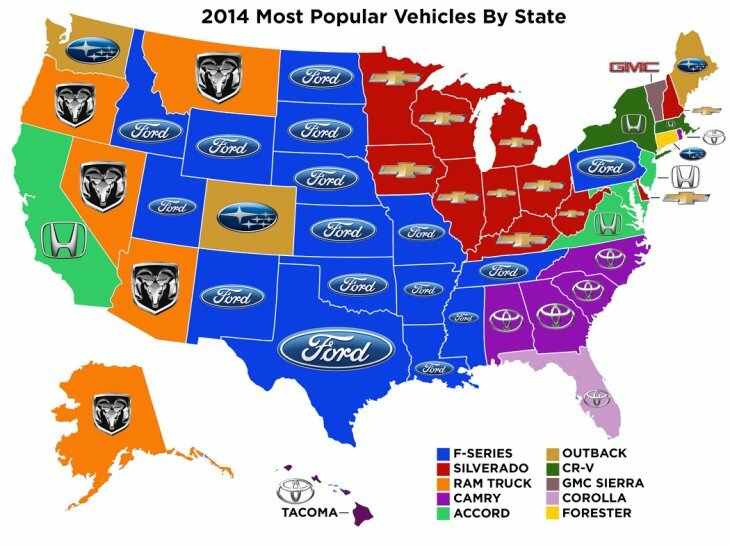 The map depicts the most commonly driven vehicles by state for 2014. As you can see, most Americans are representing their nation by sticking to American manufacturing companies such as Ford, Chevy, and Dodge. One interesting thing to note about all the brands listed on this map is that all the manufacturers on the list (minus Subaru) have raced in NASCAR. One criteria for a company to race in NASCAR is that there must be a manufacturing station within the states. Sorry Subaru, for now you will have to stick to doing heartwarming family commercials. Now that you know which are the most popular cars in the U.S, now lets take a look at the most popular cars sold in 2014.